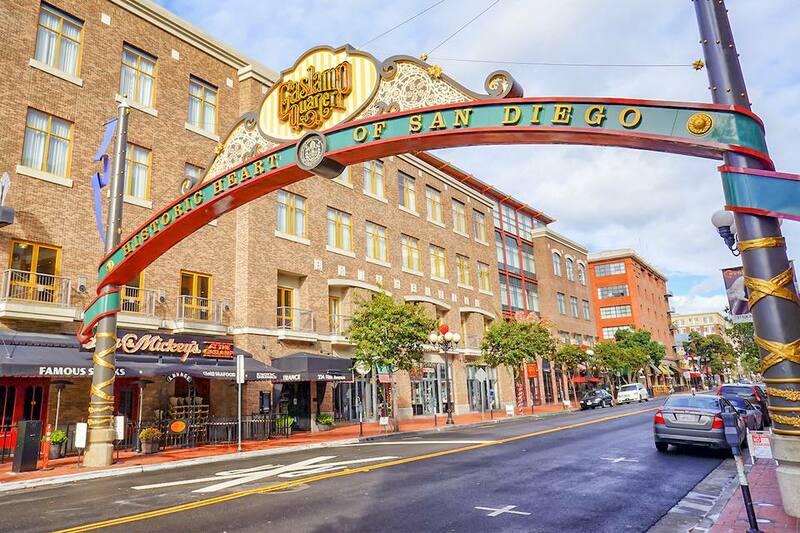 San Diego's Gaslamp District is one of the city's oldest neighborhoods and one of its best-known. But what is it exactly? Basically, it's an area with a lot of architectural charm. Its streets are lined with nineteenth-century buildings restored to their original exuberant appearance. Today's Gaslamp is full of restaurants, shops, and clubs that occupy former brothels and saloons. What's the Big Deal About the Gaslamp District? Most visitors go to the Gaslamp for the shops, restaurants, and nightclubs. You'll find boutique stores offering interesting wares alongside t-shirt shops and souvenir sellers. Horton Plaza is the local shopping center. When your energy fails, you'll find more than 70 restaurants and clubs where you can refuel. San Diegans may not turn up their noses about the Gaslamp quite as high as San Franciscans do about Fisherman's Wharf, but few residents go out of their way to visit. In fact, most of the people who are in the Gaslamp are tourists or those attending meetings at the nearby convention center. With so many visitors who are only in town for a few days, local businesses tend to focus more on getting people inside their doors than they do on service and quality. Although some places may be an exception to this, in my experience, restaurants in the area tend to provide mediocre food and deliver indifferent service. A random walk will give you a sense of the Gaslamp. It's only a few blocks in each direction, making it easy to enjoy the lovely buildings, do a little shopping and have a meal. It's a fine way to visit, but you can get much more out of it if you take your time. The Gaslamp gets much more interesting if you stop to look at the buildings and learn about its history. You might see a house that was built on the East Coast and shipped around Cape Horn to San Diego in the 1850s, walk past former brothels and drug dens, or see electric versions of the old gas lamps that give the area its name. And you will definitely be strolling down some of the same streets as the legendary Wyatt Earp, who owned gambling halls in the area and lived at the Horton Grand Hotel. Earp was listed as a capitalist (gambler) in the 1887 San Diego City Directory. If you take a guided tour, you might learn why the neighborhood was once called the Stingaree. You can take a guided walking tour from the Gaslamp Foundation to do that. They leave from the Davis Horton House at 410 Island Avenue (Fourth and Island), which is also home to the Gaslamp Museum. Ghostly Tours in History offers a night-time ghost tour of the Gaslamp, a good alternative if you want to be out at night and aren't a nightclub-goer. See more spooky details on their website. Is the Gaslamp District Right for You? Should you go to the Gaslamp when you're in San Diego or not? That depends. If you're a convention-goer, it's a nice place to walk around and easy to get to when you have a little free time. If you like architecture, it's worth a visit to see the gorgeous, well-restored old buildings. If you're looking for a great meal, you'll be better off to go somewhere else. And depending on your likes and dislikes, you may want to avoid the crowds that fill the sidewalks on weekend nights. Public restrooms are at the corner of Third and C Streets. There are lots of restaurants in this small area. Unfortunately, a restaurant full of people isn't always a good place to eat in the Gaslamp. That's because many eateries spend more energy to get people in the door than they to do to provide them a good value for money once they're inside. Use a practical approach to choosing one: Stroll around and preview the menus or check an app like Yelp for ratings. Or pretend to be a San Diegan and go somewhere else. Where Is the Gaslamp District Located? The Gaslamp District is in downtown San Diego near the Convention Center. Officially called the "Gaslamp Quarter," the rectangle-shaped, sixteen-square-block area is bounded by Broadway and K Streets between Fourth and Sixth Streets. You can get more information about it at the Gaslamp District Website. If you're at the Convention Center, walk across Harbor Blvd. at 5th Avenue - you'll be facing the entry arch. If you're at Seaport Village, walk away from the waterfront on Kettner Blvd., cross Harbor Blvd. and turn right onto G Street. You'll be there in a few blocks. Take the San Diego Trolley to Gaslamp Station or 5th Avenue Station. On the waterfront, hail a pedicab (an open-topped, bicycle-powered vehicle). They charge a flat fee for a point-to-point trip, and rates are somewhat negotiable when they're not busy. If you're using a GPS system, set it to 207 5th Avenue, which is at the Gaslamp entry archway. You'll find a 550-space parking garage at Sixth and Market. The San Diego Gaslamp District got a slow start. The city's earliest residents moved away from the waterfront, choosing instead to build at the elevated location of today's Old Town. An early development project near the waterfront failed, so utterly that the area came to be called Rabbitville, in honor of its only inhabitants. In 1867, entrepreneur Alonzo Horton built a new downtown near the water, and soon the area was booming. Gamblers and prostitutes moved in. Over the years, stores moved toward Market Street, and all that remained was a red-light district known as the Stingaree. The Gaslamp District languished for many years before its current renaissance.